I shall from time to time be running pieces about how NLP, coaching and mindfulness have been used by successful people. I’ll be doing this in the spirit of curiosity rather than high-pressure salesmanship. I’m not trying to say that you too, could have the charisma of Bill Clinton if you come on our three day NLP course. But I do find it interesting how successful people use, or have used, the skills we teach and reckon that we can all learn from them. Actually, Bill Clinton is a good place to start. Even people who dislike his politics admit that he has tremendous charisma. Naturally Robbins does not disclose what he told the President, but it seems that a key point of the discussion was about legacy, with him (Robbins) helping the embattled politician rise about his difficulties at that moment and see his whole time in office in a bigger, historical context. This is classic NLP, moving the issue from Behaviour (what should I do?) up the Logical Levels to Values and Mission. Clinton also later said that Robbins reminded him that, in any situation, he still had choices. Flexibility and choice are key values in NLP. The Meta Model constantly reminds us how we limit our perceptions of our own choices with faulty thinking – especially under stress (which was no doubt a problem for Clinton at that moment). Are part of how we teach NLP. At the heart of these lies the ability to truly listen to other people, to direct our attention to them. Here are George Bush Senior and Clinton answering a question from an audience member in a debate during the presidential election of 1992. 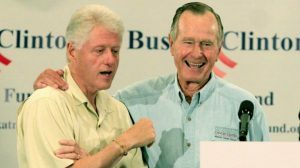 (Bush was the incumbent, Clinton the challenger). Bush’s attention is all over the place (including looking at his watch just at 0.03, as the question comes in). Having consulted his watch, he begins by speaking in generalizations (politicians often make in NLP speak ‘Meta Model violations’, meaning huge unsubstantiated generalisations and other types of ‘fuzzy’languge ). Bush seems more interested in himself than the questioner. He finally makes some kind of contact with her at 0.54, but clearly can’t wait to break any attentive link. When he finally feels he’s said enough, at 2.30, he’s already turning away as he ends the conversation. Clinton, by contrast, locks his attention onto the lady from the moment it’s his turn, even before he starts speaking (he keeps it there throughout his ‘piece’, though adds occasional glances away to stop it being too creepy). Later, he too goes into a ‘big-chunk’ generalisation about the causes of economic stagnation, but he gets away with this because he has both established a personal link and his authority before he does it, and because he clearly keeps his attention on the woman as he does so. 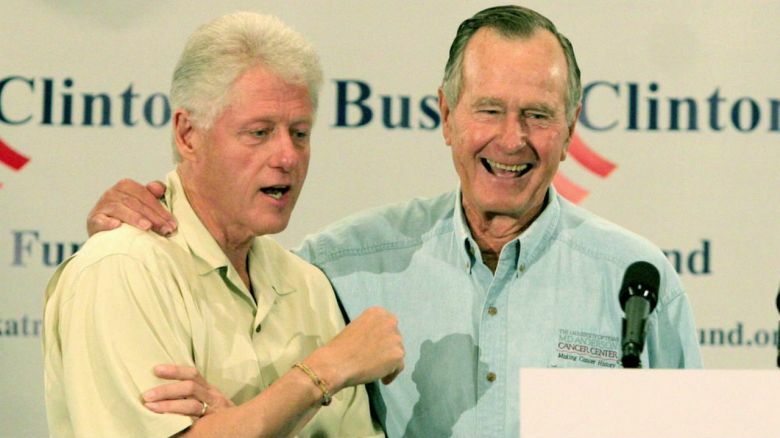 The video is probably unfair to Bush: he was not on good form that evening. But that is in a way the point, the deep communication skills from NLP, coaching and mindfulness put Clinton above ‘being on good form’. Book on to one of our many NLP related courses and events. Are you particularly interested in the charisma that successful people possess? we are experts in NLP modelling, and can even advise on how to mirror successful people. Call us today on 0207 428 7915 or contact us via our contact form.